Can An Engineer Write? 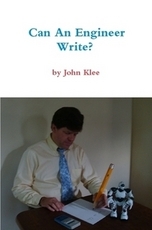 is a collection of poems and short stories written by an actual engineer. You will believe that an engineer can write -- even compose verse with perfect rhyme and meter! Never before in human history has an engineer published a collection of his poems and short stories. This means you can make history by reading this book! What would America be like today if Daniel Boone had owned an M-16? How about if he owned a jet ski? What would be the consequences if a graduate student stole and used a mind-reading machine for a weekend? Can prayer alter the outcome of a basket­ball game? Have you ever read an ode to a robot? When’s the last time you’ve read a decent poem about Spring? Does a certain Beach Boys song direct our nation’s youth down the path of dissipa­tion? Maybe you’ve read a haiku at some point in your life, but have you ever actually read a genuine Haiklee? The answers to all these questions can be found in this book.